Just to prove I'm not making an outlandish, clickbait-claim in the title, let’s cut straight to a screen shot of our web traffic analytics. In August 2017 our organic traffic was 1,091, and by February 2018 it reached 3,497. That's a 220% increase in 6 months. And in fact, it has continued to grow, reaching 9,214 in September 2018, making it a 744% increase in just over 12 months. I want to tell you a little story about how we got to this point. Because it didn't just happen miraculously. 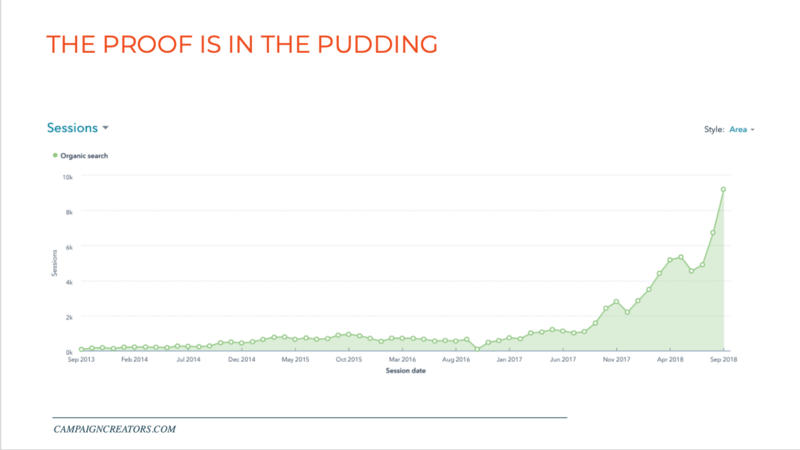 My agency was actually founded in 2010, under the name Business on Market St. - you can only see data on the chart below starting in 2013 because that's when they moved the website to HubSpot's CMS. The founders believed in the power and promise of inbound marketing and began blogging from the very start. And the company blogged consistently for 6 years. You can see below the best organic month they had was October, 2015 with 937 organic visits. Now in October 2016, the Business on Market St. pivoted from being a full service agency to a conversion focused inbound agency, Campaign Creators. With the pivot came a rebrand and a website relaunch. Which, unfortunately, tanked our traffic. From October to July we worked to republish legacy blogs from the old site along with creating some new content. And we started to make a very slow recovery. 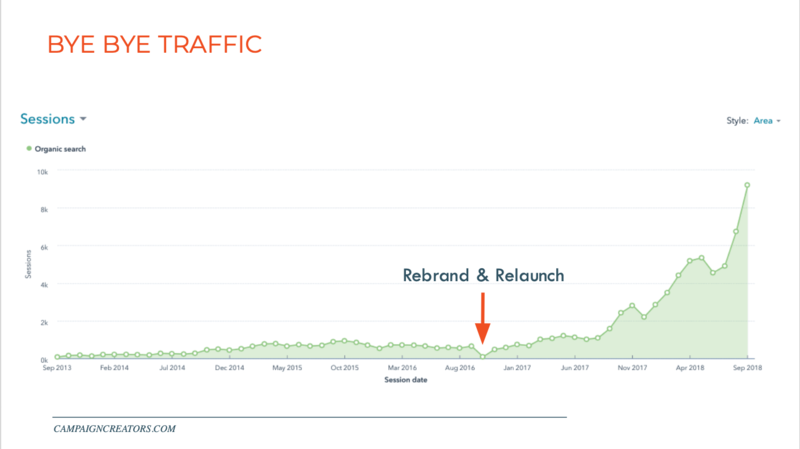 By July, we had recaptured the organic traffic lost during our relaunch. Around June or July, I began to hear chatter about pillar content and SEO content clusters. Then I attended Justin Champion's Workshop on Pillar Content Creation. I naively thought - we should try that. Plus, it seemed like the perfect summer project for one of my interns. So we (mostly she) got to work, and in August we officially launched our Content Pillar Strategy. Now I went into this whole thing without a deep knowledge of what was going on in search. But I thought you might all want to know why this strategy worked for us (that it's not a one off fluke) and why I believe it will work for you. The traditional view of “keywords” in search has changed. Where a few years ago there were maybe 10-20 “big keywords” that would be sought after for ranking within a topic, there are now hundreds or thousands of long-tail variations that are regularly searched… Simply dominating a few words is no longer enough to produce successful results. Search engines have changed their algorithms in response to consumers’ behavioral changes. Years ago, people posed fragmented keyword queries to search engines to find answers to their questions. Nowadays, most are comfortable posing complex questions to a search engine, and they expect an accurate and timely result. Searchers who want a specific answer also use many different phrases in their queries, and now search engines are smart enough to recognize the connections across queries. Algorithms have evolved to the point where they can understand the topical context behind the search intent, tie it back to similar searches they have encountered in the past, and deliver web pages that best answer the query. October 18, 2011: Google announced they would be encrypting search queries, for privacy reasons. Unfortunately, this disrupted organic keyword referral data, returning "(not provided)" for some organic traffic. April 2012: Google rolled out the "Webspam Update", which was soon after dubbed "Penguin." Penguin adjusted a number of spam factors, including keyword stuffing, and impacted an estimated 3.1% of English queries. 2013: Then the first real big shake-up related to this change occurred with Google's Hummingbird update in 2013. The search algorithm began parsing out phrases rather than focusing solely on keywords. Many SEO professionals see Hummingbird as Google’s official switch from a keyword to a topic focus. 2014: Google shook the local SEO world with an update, dubbed Pigeon, that dramatically altered some local results and modified how they handle and interpret location cues. 2015: In this Mobile Update AKA "Mobilegeddon", Google revealed that mobile rankings would differ for mobile-friendly sites. Late 2015: Google made a major announcement, revealing that machine learning (RankBrain) had been a part of the algorithm for months. Ultimately, RankBrain enables Google to better understand the intent behind specific queries without the search query explicitly stating them — all with the goal of providing more relevant results to the searcher. WHAT DOES THIS MEAN FOR MARKETERS & SEOS? The way to approach this new future of content marketing strategy is to look at your visibility across a topic, as opposed to a specific keyword. By organizing content within topic clusters instead of individual disjointed posts made for an individual keyword, you’re able to capture a large amount of search traffic across an ever-increasing pool of relevant keywords. WHAT IS A TOPIC CLUSTER CONTENT STRATEGY? To best answer this, we need to ask ourselves: What does a topic cluster content strategy look like in practice? Topic clusters comprise of a pillar page and cluster content created around 6-8 cluster subtopics that address specific questions your customers may be exploring related to the core topic of your pillar page. A pillar page is a comprehensive resource page that covers your core topic in-depth and links to each cluster content page. Each cluster page is then linked back to the pillar with the same hyperlinked keyword. Cluster content should also be linked to other cluster content in its cluster subtopic. The cluster organization signals to search engines that the content has more in-depth information on the topic, in turn, giving your pillar page a higher level of authority on the topic while gaining higher search placement from orderly linking. Additionally, one high performing cluster page can elevate search rankings for all the other pages linked to the same pillar. Here's what I had to start with: 6 years worth of blog content on everything from how to run a small business to brand creation to inbound marketing. While there was some internal linking between content, there was no organizational structure to the content. We looked at these problems and thinking about our services, which were much more narrowly focused after our rebrand, we grouped them into broad topic areas that we wanted to be seen as experts on. 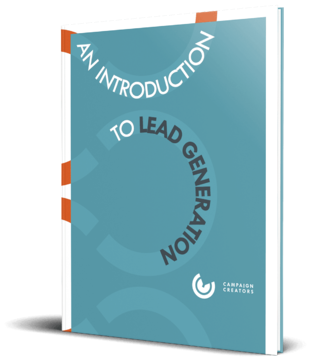 These expert areas were lead generation, lead nurturing, and marketing technology. We then filled in each topic with potential keywords we thought our audience would search for. To do this we used KWFinder by typing in our broad topic and then looking through the suggestion for keywords that had a decent search volume, a possible or easy keyword difficulty, and that we believed our core persona would search for. Another tool we had had our disposal was HubSpot's Content Strategy Tool which makes subtopic suggestions or will help you validate subtopics based on search volume and similarity to your core topic. Then came the really monotonous part. Auditing all of our old content and categorizing it under our new core topics and subtopics. Excel was definitely our friend for this. We created a spreadsheet with 4 columns: blog url, blog title, pillar topic, and subtopic. First, don't try to fit a square peg in a round hole. As I mentioned, we niched down our services quite a bit with our rebrand. This meant that quite a bit of our legacy content did not fit under our core topics. That was okay, some of these pieces we kept live on our site and just didn't include them under a pillar. In particular I took this stance for any content we were ranking highly for. Secondly, this is a great opportunity to clean out your content closet. In the process of the audit I realized we had some crappy content. Now, if the content's subject fit well into our new pillar strategy, it was marked to be updated, but if it didn't, I threw it in the digital trash. Now once we had all of our content sorted, we needed somewhere to link them to. We created a very basic pillar page. We did this one topic at a time starting with lead nurturing. You can see what it looked like below. Basically our core topic served as the H1: Your Definitive Guide To Lead Nurturing, then each subtopic was presented as a H2 followed by short description of that subtopic and a list of hyperlinks out to the pillar content pieces related to that subtopic. Nothing fancy. Next we began updating all of the blogs categorized as Lead Nurturing by linking them to our Pillar page. You can see we did this using the line, “This blog post is part of Your Definitive Guide to Lead Nurturing.” And then being sure to include links to other content under the same sub-topic throughout the post. Then as we re-published each blog we would add a hyperlink to the post on our pillar page. Again, during this step excel was our friend to keep track of our progress. To our previous excel sheet with the blog title, url, core topic and subtopic, we added columns for the internal links that were added, whether the page had been linked to the pillar page and whether the pillar page had been updated to linked to it. As I said we tackled one pillar at a time. After 3 months of creating, linking and organizing content, we had created three pillar pages with their own unique topics: lead generation, lead nurturing and marketing technology. As we all know with SEO, the job is never really done. Now that we had dealt with our legacy content it was time to plan for the future. This consisted of mapping out what content to create in the future. We did this by mapping out content ideas that aligned with each subtopic. While we did do some initial internal brainstorming to generate ideas, we made use of several tools to expand our list. I returned to KWFinder, but this time I used the question search function. This function gives you a list of question style search queries that are related to your subtopic along with their search volume and KW difficulty. This allows you to more precisely pinpoint exactly how your target personas are structuring their search, what keywords they're searching for and how they are phrasing their question. I also used Answer the Public. I love this tool because it maps out even more questions being asked on your topic grouped by question stem. For example, say you searched "lead nurturing". You'll get results from each question stem such as "How to implement lead nurturing? ", "What's lead nurturing? ", and "Why is lead nurturing important?". Lastly I returned to HubSpot's Content Strategy tool to see what long tail keywords they suggested for each of my subtopics. If you're a HubSpot user like we are, this tool can be incredibly helpful, especially because you don't need to open any other application. You can get everything you need: keyword relevance, popularity, and competition all in one place. With our blog topic content list finalized, we spent the next 6 months producing this new content. Then we decided to optimize our Pillar pages. Many of you know Google rewards you when a person spends more time on your page. We also wanted to make sure our page was optimized to convert our traffic into actual leads. The optimized page now delineates between different resource types, has more in-depth introductions to each subtopic, key definitions and diagrams, and CTA's to our lead magnets. We then began turning our subtopics into pillars in their own right. Starting with Conversion Rate Optimization. Now enough about me, let's talk about you. But really, I've shown you how we did it, so now let's start mapping out your very own pillar content strategy. 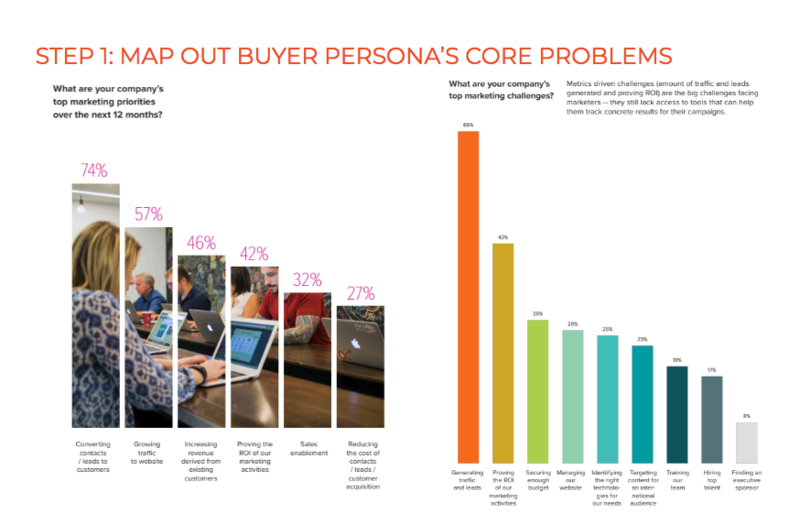 Reminder: Buyer personas are semi-fictional representations of your ideal customer. What are their pain points that your product/service helps them solve? What goals does your product/service help them meet? Identify topics that you want to become a subject matter expert on and rank for on Google; it must be educational, but directly support one of your products or services. It's important to identify and focus in on a few topics, or else you'll end up spreading yourself thin and stunting your ranking. You will want to perform a series of searches on Google and see what content already exists around this topic. Make note of what you find and brainstorm what else you can add to the conversation. Think about how your content will stand out or outperform what already exists. Edison Research found that Americans are actually using social media LESS, especially Facebook. Facebook, Instagram, and Twitter have all rolled out new algorithms in the past two years that fundamentally diminish exposure for company and organization content in favor of content published by individuals. Good for us as social media users, bad for us as businesses. Some of the algorithm adjustments in social media have given more reach to video content and, to some degree, photos. Simultaneously, the algorithm gives posts containing links less priority. This also has an impact on click-through traffic. Search engines are doing a much better job of indexing social media content right on their SERPs, making it possible for consumers to click-through from search, instead of going to a social network and clicking through from there. Smart marketers have paid attention to search throughout social’s rise, but this data clearly shows that social’s days as the number one driver of traffic are at an end. Google is certainly working hard to stay in front, as any decline in their ability to drive traffic is almost an existential issue for them financially. It would be wise to follow their cue and re-prioritize search in your overall digital marketing plan. Keeping up with SEO trends and updates is a never ending battle. 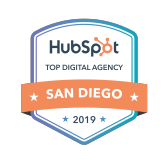 Register for the next Live In SD webinar, How to Succeed with SEO in 2019, with HubSpot SEO strategist, Victor Pan, to learn what you need to be optimizing right now and in the future, what Google's latest 20 year announcement means for you, and why the fundamentals of SEO still matter.